Below is the official press release which gives the details of the soundtrack release along with the location of the free download. And don't forget, Niki - Rock 'n' Ball will be coming out on the North American WiiWare service this coming Monday! 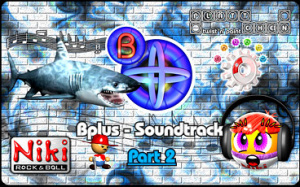 Bplus, independent software developer, today announces the release of the 2nd Part of the exclusive Bplus Soundtrack, available for download for free. Part 2 of the Bplus Soundtrack contains over 12 Minutes of the outstanding musical score of Bplus' innovative WiiWare™ titles PLÄTTCHEN - twist 'n' paint and Niki - Rock 'n' Ball, distributed in high quality MP3 format. Together with the first part of the soundtrack, the second part can be downloaded free of charge in the Bplus Forums. In the corresponding thread, Bernd Geiblinger, composer of the Soundtrack, also reveals exclusive insight and talks about the intentions he had when creating each piece of the rich score of Bplus' games. The next parts of the Bplus Soundtrack will be released in the future. cool but not for me. Why bother posting then guys!? I might download this purely because the music was the only good thing in Plattchen. What a stinker of a game. I'm considerig getting Rock n Ball after the glowing review here, but I am scared after my Plattchen experience. Please someone else assure me that it isnt a big turd! I'm loving video game soundtracks lately...and live performances of video game music are fun, too. I've recently come across live performances of Mario music, Zelda music, Mega Man music and Metroid music by really great bands...it's so much fun hearing the audience go nuts over video game songs. @Doogle-At least its not them going "FIRST!! !11 omg!" "Second!!" I even saw someone say "FIFTH" Seriously? What is the point in anything but the first comment, and even then it's gotten old. Oh its just a game some people play. ^Sort of like flame wars ya know? 100% chance I won't download this, as I do not really wish to. Downloaded it because it's free, I want my 1 minute of downloading time back. This is crap. This music sounds like AIDS! I liked the first part, so I'm getting this one too. @Doogle: If you put more time into PLATTCHEN, you will likely get a lot more out of it. Niki is also a very good game, especially in co-op, although the game does get very difficult in the second half. @Trucker: So does your face. BURRRN! Also, this album is fairly good, with the PLATTCHEN copycat and mission soundtracks bringing back memories and wanting me to give them another go. If you haven't played the game though, guys, this edition probably isn't for you. IMO, the first one was superior. Either way, I can't wait for the next part. @Wiiloveit - I put enough time into Plattchen to know that I really hate it. I can't see how someone would find any enjoyment out of it at any level. Maybe it's like Marmite or something? Your review giving it 25/30 is completely barmy. Are Bplus slipping you a backhander? @Doogle: No Bplus are not, and I even let good ol' Bernd know that whatever I said would be honest and truthful. I just gave it a lot of effort and time, and although I really wasn't too fond of it for a while, it slowly grew on me, and I began to play it more and more for fun, rather than as a reviewer. The enemies were a big letdown for the game and made it a lot harder and frustrating that it needed to be, but the core gameplay, alongside the great presentation and multiplayer co-op tactics, was a great new concept that should be relived in future puzzlers. The only letdown out of the whole thing was the overuse of enemies and the incredibly high difficulty setting at times (alongside the need for a Wii Zapper on occasion), I just think that many other reviewers knocked more points off PLATTCHEN for these errors than I did. Maybe it is just like marmite as you said, although it's also one of those games where you need to play it to understand it properly, which isn't too good a combination, I agree. Hello! I'm sorry for being a naughty muffin, going all off-topic and such, but I was wondering if I were to pick up a Wii Points card in merry ol' England, could I then take it back here to Denmark and have those points work on my Wii here? I'm guessing "yes", as we're both Euro-centric, PALs is PALs, etc., but I'd like to be sure. And one thing I've learnt is that in order to be sure of something, just ask the fine posters at wiiware-world.com. @indenmark: yes, I believe you can, as long as you bought it in Europe. The Wii Points card boxes have a list of countries that it applies to on the back anyway. Loving the new avatar. Oh, and i bought Princess Mononoke on DVD earlier. Absolutely brilliant. Let's try and keep our posts a bit more on topic this time though. @Terranigma: Ooh, I saw Princess Mononoke once - it wasn't for me, although I did see the achievement in animation. I preferred Sprited Away, although what I've seen of Grave of the Fireflies was also quite good too. Let's try and keep our posts a bit more on topic this time though. Oh. Erm... MUSIC. There, that oughta do it. My Cousin has Niki so i'll probably download this for him as he likes the music in the game. He has quite a few game soundtracks as well so this will be another to his collection. He's not sure whether to get Plattchen though, due to the high price tag in Europe. I only say that because me and Beastman93 went quite a bit off-topic not too long ago and we were talking about Anime and Time Zones (Yes, i said Time Zones) and the posts were deleted. Spirited Away and Grave of The Fireflies were brilliant. GOTF is one of my favorite films of all time. I can't wait for Bplus to announce a 3rd game with another good soundtrack. Admittedly, it wasn't as good as Miyazuki's other works but i still thought it was good. Maybe brilliant was too strong a word. Quite good is probably a better term. I also liked Ponyo on the Cliff by the Sea (Watched it in Japanese with fanmade Subs) and Howl's Moving Castle more than a lot of other Ghibli films. Howl's one probably mentioned by more casual people than usual but does that really matter that much? I really didn't get Nausicaa, but I'm interested to hear about Ponyo of the Cliff since my Mum's Japanese pen friend went to see it and says it's really good. (True story). I also have a couple of Ghibli films I recorded to my hard drive over the Winter holidays, such as The Cat Returns and My Neighbour Totoro (although I forgot to set it for Howl's Moving Castle). Oh... and MUSIC. I liked Spirited Away because it was random most of the time. Still, I will admit that I liked Kiki's Delivery Service and Howl's Moving Castle a lot more. I wasn't really fond of Princess Mononoke, though. My Neighbor Totoro was also pretty good. I also saw one where some girl falls in love with some guy who wants to be a violin maker, although I can't remember the name of it. It was pretty good, for a love story. And I also saw another one...where there was some lady...the lady apparently liked to hide animals in her dress...there were some monsters...some war going on, I think....the lady dies...monsters grow tentacles and do something to her dead body. Yeah. I can't remember the name of that one either. And I could've sworn I saw Castle in the Sky, but I can't remember it. Gotta make sure to watch it again, as well as Whisper of the Heart. And Porco Rosso, since I only watched a few minutes of that. Oh yeah, and I'm not getting this soundtrack either. Don't care if it's free, I still don't want it. Ooh! Here we're talking about Ghibli, Nice , love all those movies, a friend of mine has the entire DVD collection, from Naussica to Howl's Moving Castle, I've seen them all; no one has mentioned Only Yesterday nor Tanooki Wars their good, specially the second one, how can't you love a bunch of racoons pretending to be humans; but my all time favorite is The Cat Retuns; my friend even has the soundtracks of them all, their music is so astonishing. The movie with the writer girl and the violin maker guy is Whisper of the Heart. Okay, so I did watch that one! I only watched some of his movies on TV film festivals on Cartoon Network and Turner Classic Movies, so I definitely haven't seen all of them. Still, of the ones I have seen, I'd say Howl's Moving Castle is my favorite, followed by Kiki's Delivery Service. @Wiiloveit: thanks for the answer. That's good news. And even better news is that I just found out that the excellent NES game "River City Ransom" IS available in Europe, under the rather generic title, "Street Gangs". Now if someone would please tell me the name in Europe that "Super Dodge Ball" has been changed to, I would be most grateful. And don't say "Donkey Kong Jr. Math". Oh, and sorry to the rest of the good people on here for straying so far off-topic. Music. I also saw Totoro, Castle in the Sky, Howl's, Kiki's, and Porco Roso when Cartoon Network did Miyazaki Month. I liked all of them, with Castle and Porco on the high end. I'd been Netflixing them because they can be expensive/hard-to-find DVDs but now that I don't have that, I should eBay them. BPlus' 3rd game will be...a shark strategy game. There, I edited my post so that in includes the word "MUSIC" in it, so now that post is on topic. And since I just mentioned MUSIC again, this post is also on topic. @Objection Blaster: No it won't be. Where'd you get that idea? That was the lamest attempt to get your post "on topic" - by lying. @indenmark: I got a new Wii Points card yesterday, and it will definitely work. Here's screens of the box (which has been given a nice update to before). Oh - and VGSoundtracks are teh shizzle. @Wiiloveit-It's called sarcastic humor, since PLATTCHEN has a bunch of random things going on (including a shark) and Niki is about a bunch of smiley-faced balls. But thanks for that. @MIckeymac. Or even doublely on-topic since you said it twice. lol. i think if another discussion goes on during a page, as long as it's not just one person and its not inappropiate, it doesn't matter if it's off topic for a little while.